Keeping your cables neat and out-of-the-way of the moving parts is important to avoid damage, jams and other frustration. 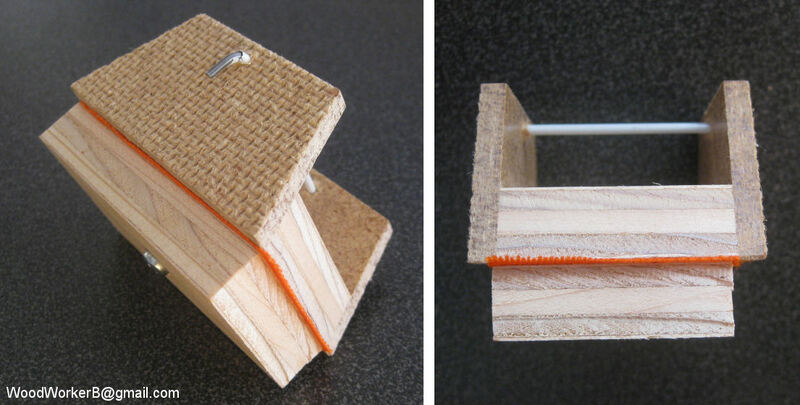 Here is a concept for a simple and effective cable carrier using basic materials. I experimented making a cable tray. The results are good, and it is durable. The tray is made from a ‘sandwich’ of three parts, the tray itself, a layer of canvas-like “hinge” material and a plain flat bottom piece. The flat bottom piece prevents the cable tray from collapsing downward when it is up-in-the-air. Here’s an image of the cable tray in place. Simple, inexpensive, fully functional. You can ‘futz’ with these dimensions. Make the angle sharper for a tighter turn, make the tray wider or narrower, whatever suits your design. I started by ripping two lengths of ½” plywood to a width of 1 1/2 inches. 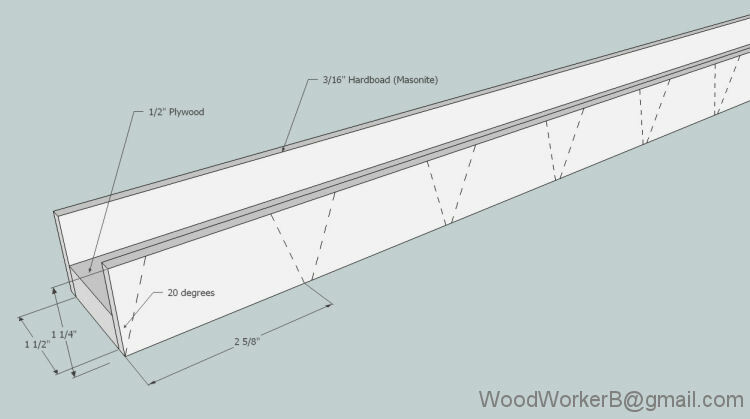 I ripped two equal length strips of 3/16″ hardboard (¼” would work fine too) to a width of 1 1/4 inches. I glued-and-clamped the hardboard strips onto the 1/2″ plywood, forming a U-shaped ‘trough’. In the drawing you can already see how the tray will fold. Step 1, create a “U” shaped track and cut into sections. Cut the other 1 ½” strip onto segments exactly as long as each of the tray segments (2 5/8″ in my case). These small segments are screwed to the “bottom” of the tray – this will prevent unwanted bending in the “wrong” direction when the tray is suspended upside down. Cut rectangular ‘stops’ – these are what prevent the tray from collapsing when upside-down. The idea is to end up with a ‘sandwich’ of parts, as demonstrated below. This is only one segment for example only, the orange “duck cloth” (bright orange, canvas like material) needs to be a continuous strip the length of the cable tray. Cut a long strip of duck cloth 1 1/2″ wide, a bit longer than the total length of the cable tray. I lined-up all the cable tray segments and secured them between two boards so the wouldn’t move during the gluing step. I coated the underside of the tray and one side of the duck cloth with contact cement. Once dry per the instructions, gently stretch the duck cloth and glue it to the tray. Two people works best here. The bottom piece is carefully lined up and held in place with a #6 x 3/4″ wood screw (no contact cement). A small bit of bent coat-hanger completes the assembly. John Nicol posted a well documented page on his implementation of the cable carrier. He took his photos as he built it, rather than when it was all done (like me). 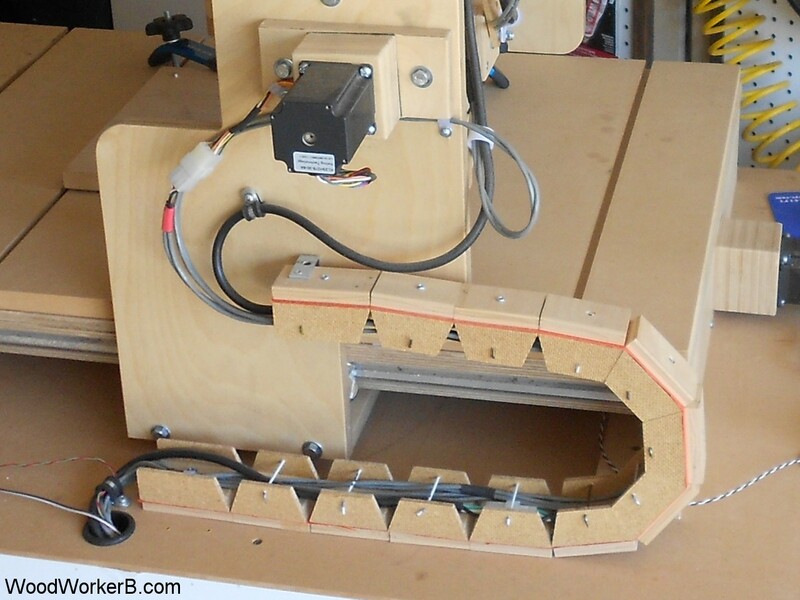 Check it out: DIY CNC Cable Carrier by John Nicol. Low cost, high quality, high power Stepper Motor Driver board kits, perfect for the DIY Mill, DIY Router, or DIY mill.